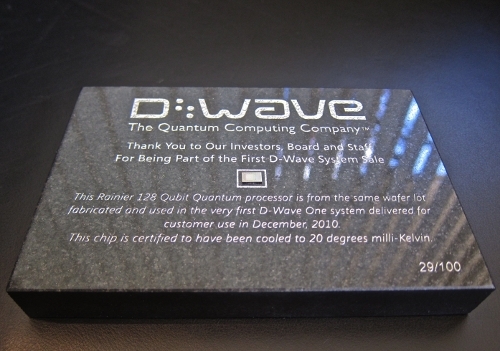 D-Wave is a perfect example of a niche business: company that sells the world’s only commercial quantum computer. They just scored their second client – a collaboration between Google, NASA and the non-profit Universities Space Research Association. These guys will explore machine learning and other stuff, probably with the usual ultimate goal to create a super-intelligent computer and make it rule the world. This entry was posted in Geeky Stuff and tagged future tech by bcat. Bookmark the permalink.